Tonight on FOX their new medical drama The Resident airs with an all-new Monday, April 1, 2019, episode and we have your The Resident recap below. 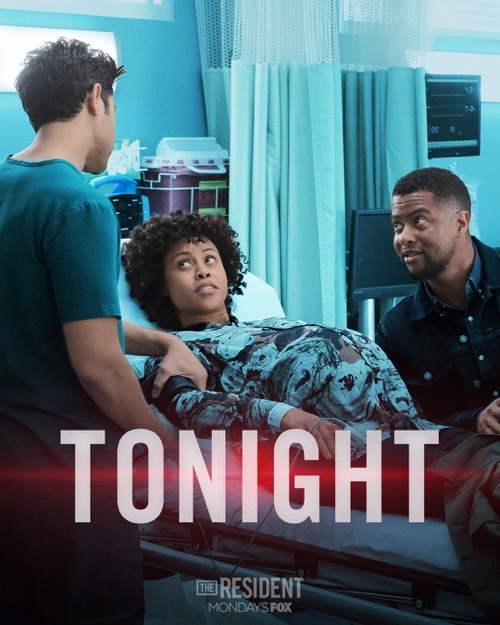 On tonight’s The Resident season 2 episode 20, “If Not Now, When?” as per the FOX synopsis, “Devon grows concerned when a mother’s complaints go unaddressed after her delivery, and pushes Bell to take drastic measures. The Resident season 2 episode 20 airs at 8 PM – 9 PM ET on FOX. Make sure to bookmark this spot and come back for our The Resident recap! While you wait for the recap make sure to check out all our television recaps, news, spoilers & more! Tonight’s The Resident Recap begins now – Refresh Page often to get the most current updates! Nic and Conrad finally meet to talk at her house. Nic feels pressured by his need to further their commitment. After some back and forth Conrad gives his key back. They both leave, Conrad on his biked and Nic in her car. On her drive, she pulls over upset and witnesses a car’s windows being shot out. Another car swerves and hits the other car. Nic runs to try and help. The patients arrive at Chastain. Conrad, Devon and some of the team get to work on a young boy who has an injury to his leg. He is bleeding profusely but reports no pain. They turn him and find a gunshot wound near his spine. His mother has also been shot. Meanwhile, a pregnant woman in the ED is brought in to be assessed when her baby’s heartbeat doesn’t sound regular. Mina and AJ are assessing the mother when she begins bleeding heavily. Mina covers the wound. They rush to the OR. Devon is asked to scrub in to help deliver the pregnant woman’s baby. He assists with a c-section, delivering a healthy baby girl to happy parents. Nic tells Conrad how she was in front of the family whose car was shot up. It should have been her. Conrad is happy she is okay. He has bad news that can’t wait. Jessie isn’t doing well on dialysis. Nic tells them that they can tell her together. Dana and Bell look over the young boys x-rays. They aren’t sure if he will walk again. Nic and Conrad tell Jessie the news. She doesn’t take it well. After 6 months she can go on the donor list. It doesn’t make her feel any better. Nic tells Conrad she will donate her kidney. Bell and Dana scrub in to operate on the young boy. The new father thanks Devon for his daughter. Devon notices blood in the foley urine bag of the mother. He tells the doctor who brushes it off. Dana begins to shake when it is her turn to fix the boy’s spine. Bell tells her nicely to pull it together. She needs to stop being a mom and be the surgeon she is. The new father tries to get help for his wife who is experiencing more pain. The nurse at the front desk tells him she will be there in 5 minutes. Devon arrives soon after the husband calls him. He demands the nurse check in on the new mother. He calls the doctor and tells him that the mom is in a lot of pain. She needs a CT scan. The doctor doesn’t want to order one until Devon makes a comment that may be because of the patient’s skin color he doesn’t care. Devon checks in on the mother. She hasn’t had a CT scan yet and is hypotensive. Devon does a scan and discovers she has fluid in her abdomen. She is bleeding internally. They rush her to the OR. Mina and Aj rush in to operate. But it is too late. The doctor waited too long and they can’t save her. Mina, AJ, and Devon tell the father who breaks down in disbelief. The young boy post surgery shows his dad how he can wiggle his toes. Meanwhile, Bell talks to the new father and apologizes. Mina and Devon push for a new standard of care for new mothers so this never happens again. Bell implements an investigation and new protocols.